KKKK is the Prinicpal Partner of Coverdrive: Playing for a Brighter Future | The International Cricket Hall of Fame. On Saturday 29 April at the annual end of season match between the Chairman’s XI and Bradman Crest Members XI (BFXI). The Executive Director Rina Hore announced a new partnership with local charity the 4K’s to fund the Bradman Foundation’s Cricket Officer to deliver 40 x one hour sessions into to local public high schools to engage disadvantaged children through the exhilaration that playing sport provides. The program is designed to entice the students to have a go, laugh, share and care with fellow students in a non-threatening environment which develops their social skills. Committee members Garry Turland and Gary Avis presented a cheque for $21,000 to Chairman Maurice Newman and Director Christine Holman during the luncheon. Rina informed guests of the fabulous success which has been achieved to date by engaging over 50 students from Moss Vale and Bowral High Schools along with Tanagra Special School to attend weekly sessions during the school term. 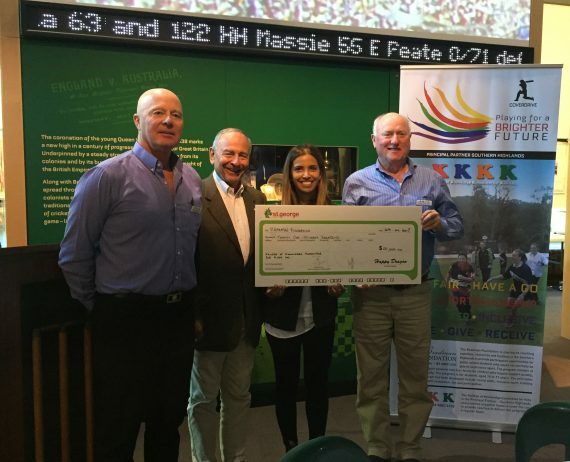 “The financial support from the 4K’s is critical to ensure that the Bradman Foundation can provide the weekly sessions on an ongoing basis. The benefit to our local community and these students will be seen for many years to come,” explained Rina. COVERDRIVE, playing for a brighter future is designed to use sport based activities and values, to teach key social skills that are considered to be important for ensuring successful classroom and social interactions. The Bradman Foundation is sharing its coaching expertise, resources and facilities at Bradman Oval to provide participation opportunities for public school students who would not normally be able to experience sport. The program consists of 40 x one hour multi-sport sessions over four terms for children who require support, socially, mentally and physically ages 10 to 17 years. The Kollege of Knowledge Kommittee for Kids is the Principal Partner – Southern Highlands and provides essential funds to cover the cost to provide coaches to deliver the program on a regular basis. Download more information about the program here.